Oli McBurnie admits he was gutted he failed to fire Barnsley to Championship safety. The Scottish international joined the club on loan on deadline day at the second attempt in January. 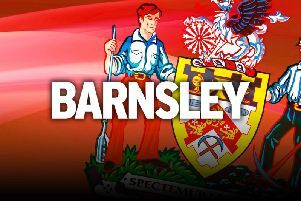 Barnsley originally thought they had their man in the summer, but it emerged days after McBurnie had started training with the Reds that the paperwork was not gratified in time. It was a costly miss for the club, who struggled in front of goal for a large majority of the season. McBurnie was looking at flats in Leeds when then manager Paul Heckingbottom told him the news. But the young marksman made up for lost time by scoring nine goals in his 17 appearances for the club. McBurnie said: “I’m absolutely devastated that we ended up getting relegated. “The truth is we weren’t good enough over the full season. I’m gutted to be leaving this way, what I wanted more than anything was to keep this club where it belongs in the Championship. Despite only being at Oakwell for the final few months of the season, McBurnie was voted as the club’s Player of the Year. On receiving the gong, he said: “I’m absolutely honoured to win the award. “It’s great to be given the award, I’m really proud to have received it from such a great bunch of fans. Meanwhile, Mick McCarthy and Simon Grayson are the two frontrunners to fill the vacant manager’s hotseat. Local lad McCarthy was the one the fans wanted after Paul Heckingbottom’s departure in February. Ironically, his last game in charge of Ipswich Town was a 1-0 win against Barnsley before he left Portman Road by mutual consent. However, as an experience Championship campaigner it is likely second-tier clubs will also be vying for his signature. Grayson has six League One promotions on his cv, but the Reds face stiff competition from Scunthorpe United to land their man.